Can four years count as an era? As far as I am concerned the last four years have had great significance. They have seen my dyed threads travel to far flung corners of the earth, in a way that I certainly didn't envisage four years ago. At that time we hadn't even developed our website! So, what is the significance? Today I completed the final page in my record book. 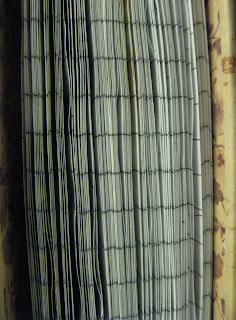 Inside these pages are the dye details of everything I have dyed over the last four years, and when I checked on the first entry I was amazed to see that it was 25th January 2005! It was a cheap book, but I have so enjoyed using it. I know exactly when it was bought and thoughts of that day bring back very happy memories. I didn't buy it for this purpose, but when I decided on my record process it exactly fitted the bill. I keep other records too, but they are kept in a loose leaf file. Details of quantities dyed, the process and how they were dried too. Other information is in that file, and it is only by combining both sets of information with a third that the full recipe will be revealed. As I dye using several different techniques all this detail is important and can therefore be easily combined according to technique. 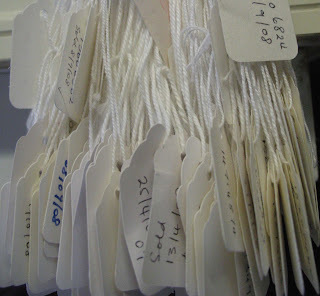 These hangtags represent the dyed items that have been sold on Etsy since I began my adventure there almost a year ago. Althought the items sold on Etsy are only from the Serendipity range they still qualify for records, although they are not repeatable. Wish I could find another just like it.........! Somehow, finishing things is always a bit bittersweet. It helps to think of it as an opportunity to start something new. What a treasure trove of information and memories that journal must contain. 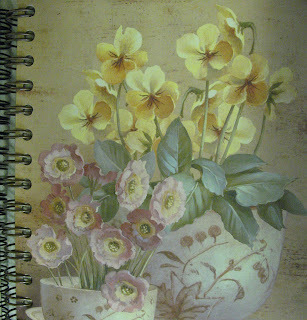 Four years in one book is incredible but how fun it will be to start fresh on a brand new page in a new journal! that is SO neat! I love recorded data, and your book holds a special history. That's a keeper! What a lovely post. How dutiful to have your records in such a cute book--you are very much the scientist with his logs! Oh my. Kudos for you for keeping such wonderful records! I'm afraid I'm a jump-right-in-and-see-what-happens kind of dyer. Can spring be on its way?